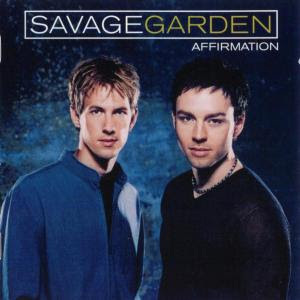 I stumbled upon this song called "Affirmation" sung by Darren Hayes of the now defunct Australian pop duo "Savage Garden"
This song is taken from their second album of the same title released in 1999. Some people find this song inspirational. Many find that the song strikes a chord in them. However, there are others who don't quite agree with the ideals promoted in the song. What about you? Do you agree with these affirmations and find them inspiring? OMG - it's been AGES since I last heard this song (it's not played on the radio as often as THAT other song)... Dang, I miss Savage Garden. Speaking of Darren Hayes, I've not heard his solo stuff since his first one. Should look into it again. Anyways, to answer your question - the affirmations are idealistic at best. For this cynic to find it inspiring is a little hard. To me, affirmations are very individual, very personal, very relative to the person. We all have different experiences, different preferences, difference ideals, etc., so what one person affirms may not necessarily be the same as the next person's. The beauty of lyrics (and Savage Garden has great romantic, real, and sensual lyrics) is actually reflecting the lyricist's life experiences and mood of the moment. "Insatiable" and "To the moon and back" are two of my favorites. I'm with some of the affirmations here, such as the bit on Karma and real love, just to name two. Some, I don't quite agree, but then again, we are all entitled to our opinions and affirmations and not everyone has to agree to them. And lyricists have this artistic outlet to vent their emotions, maybe to inspire, if you will, just like writers. Are gay people more lyrical? hmm.. Darren Hayes is gay, but you already knew that, right? what happen to your lunch at Shang post? Loved Savage Garden, but been ages since I heard their song. happysurfer, yes I agree everyone has his or her own experiences. So everyone is entitled to his or her own opinion. As for gay people being more lyrical, I really don't know. I guess you can't generalise like that. But yes,I know Darren Hayes is gay. bengbeng, well the song is almost 10 years old. Of course will sound "ketinggalan" but surprisingly Mariah carey's old songs from 10 years ago still sound good today. Either I'm a huge fan of her or she really writes good timeless music! favourite song! love it especially when it plays in gym and u runnin like pig..
Affirmation is one of my favourite hits of all time mainly because it is beautiful and inspiring. I used to listen to this song regularly as it cheers me up when i feel low. sean, which gym you go to? Mine only play the latest current hits, mostly hip hop and R&B stuffs. eiling, yeah, their songs are nice. Wonder why they stop singing? i love insatiable by darren hayes! btw, i heard that they were lover and broke up! same went with the band then. faisal admar, I heard about that too. But not sure the band broke up because of their personal relationships or some other reason.